Jassen Cullimore played a key role in helping teammate Richard Zednik get the help he needed after getting slashed by a skate. In any disaster, there are those screaming "We're all gonna die," while a smaller contingent, sometimes a single person, instantly sees what needs to be done and begins doing it. Watch the clip of the frightening injury suffered earlier this season by Florida Panthers forward Richard Zednik and you will see an amazing response from Panthers defenseman Jassen Cullimore. Cullimore was the player on the ice furthest from where Zednik was injured behind the Buffalo Sabres' net, yet he was the first player to get to, and assist, Zednik, quickly tugging him off the ice to the ramp to the dressing room. Every second -- no every split second -- was important if Zednik was going to survive, and Cullimore played a key role in the positive outcome. "Thanks for noticing, but I just did what needed to be done," Cullimore said later. It was just that kind of clear-headed thinking and steady demeanor that the Panthers needed this season, and Cullimore has been an important factor in the team's late-season run of success. Look at NHL.com's Players page for Cullimore and you'll see that he's averaging 17:47 minutes per game this season. But go to his Game By Game Log and you'll see he has averaged 23:06 minutes per game during the current seven-game winning streak. Cullimore is the Panthers' nominee for the 40th Bill Masterton Memorial Trophy that honors the NHL player who best exemplifies the qualities of perseverance, sportsmanship and dedication to hockey. Not bad for a guy who was sitting on his couch watching hockey on opening day. Cullimore didn't sign with the Panthers until Oct. 26 and didn't play his first game this season until Nov. 9. By that point, the Panthers' sputtering start had them in 14th place in the Eastern Conference. If not playing in the NHL after 13 seasons was a shock to Cullimore, the way he exited the League could only be described as painful. 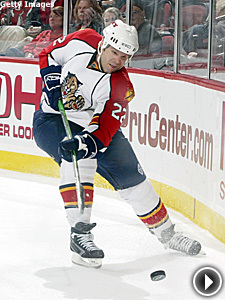 Cullimore, who won a Stanley Cup with the 2004 Tampa Bay Lightning, did not play during the work stoppage and then signed with the Chicago Blackhawks. He played two seasons there and then was included in a trade with the Montreal Canadiens. The Habs were looking to get out from under the free-agent deal they had given Sergei Samsonov the previous summer, so they traded him to Chicago for Cullimore and Tony Salmelainen. Neither player ever wore the Canadiens' sweater. "It was a little disheartening going through this past year, thinking my career was over," Cullimore said. "I was traded and bought out, all within a half hour. Not only was I traded, but the teams were doing it for money reasons and I had to look for a job. I was thinking it would be a little bit easier to find a job than it proved to be." Cullimore shopped around, but the interest seemed tepid at best. "When I signed here, a couple of other teams were interested but the Panthers had injuries on defense and it looked like I would get a chance to play," Cullimore said. "The other teams said they would put me on waivers and send me to the minors and then see what opportunities occurred. Florida did send me to the minors, but strictly for conditioning purposes. "After that, they gave me no promises and I figured I'd be possibly a fifth or sixth defenseman, depending on how well I played. I ended up with a two-way contract so there is always the risk of being sent down. We thought that would be enticing to a team because if it didn't work out, they could demote me." Cullimore said it took a while to get integrated into the Panthers' style of play. As time went by, Cullimore got fitter, played his simple game and began gaining more ice time. In recent games, only Jay Bouwmeester has gotten more ice than Cullimore. And Cullimore's plus-19 rating is tied for 20th-best in the NHL. "I think at the beginning it took awhile for the team to get used to the way I played," Cullimore said. "I'm not a flashy player. I like to keep the play with the puck simple and play positionally. It took awhile to get in game shape and for them to get confidence in me. Gradually, I got to the point we are at now. They feel comfortable with me in certain times of the game. As a player, you want that confidence from the coaching staff and the other players on the team." Cullimore said he has enjoyed the opportunity to work with assistant coach Mike Kitchen, the former coach of the St. Louis Blues. "The coaching here is great, from head coach Jacques Martin to assistants Guy Charron and Mike Kitchen," Cullimore said. "Mike runs the defense and as a defenseman, you get to know the 'D' coach best. Truthfully, if you ask a hockey player what they think of a coach, a lot has to do with how you get along. If a coach likes you, you like him. It goes hand-in-hand with more ice time. I have a good relationship with the coaches and being an older player, I try to help out on the bench." Cullimore said he almost got too comfortable sitting home with Tanya, his wife of eight years, and their little girls, Alivia, 4, and Violette, 17 months. "It was a tough five months between when I got bought out and when I signed to play again," Cullimore said. "It was a Catch-22 after spending so much time with my family. It was tough to leave because the signing and the departure all occurred within 48 hours. As bad as it was being at home and skating by myself to maintain conditioning, there were some good aspects. I got to skate with my wife a lot and we like that. So we had some quality time together. "I'm renting Gary Roberts' house here in Florida. My family has been here for awhile and my parents came down and stayed for Christmas." Cullimore said he expects he'll be talking to the Panthers about a contract for next season. The 29th overall pick of the 1991 Entry Draft still has plenty of enthusiasm for hockey. He was asked how it started. "I had an older brother and a younger brother. My older brother played hockey, so I wanted to," Cullimore said. "I really had the work ethic right from the beginning. I would spend hours in the driveway, shooting the puck."